From left to right: CUNA Director of Advocacy Shelton Roulhac, Weedmaps Vice President of Government Relations Dustin MacDonald, Budding Solutions Founder and CEO Shanita Penny, former Colorado Director of Marijuana Coordination Andrew Freeman and Maps CU Chief Risk Officer Rachel Pross. 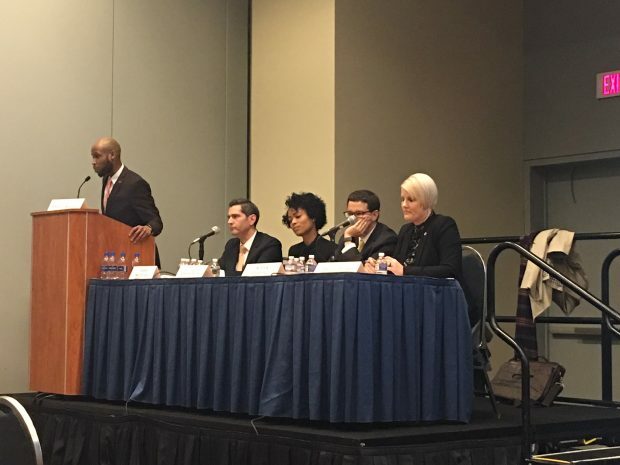 WASHINGTON – Late last month, thousands of credit union professionals convened in Washington for CUNA’s Governmental Affairs Conference to share knowledge, network and advocate for credit unions on Capitol Hill. Here’s a roundup of the key takeaways gathered by CU Times during the conference’s breakout sessions.